In high school I hid his books from my mom and the nuns. In college, it was the nuns and my English Lit professors. And yet, his publishers claim he is the most imitated poet on the planet. Out of the thousands of poems Bukowski had published, typical subjects include the workplace, women, urban life, hardship, flowers, drinking, writing and art, failure, horses and gambling, cars and driving, classical music, and death. His thoughts are obsessive and repetitive. His poems are often narrations, full of conversation, and his endings when not ambiguous, contain a line or two of brilliant, cosmic insight that comes across as accidental. And it is exactly his content and his style my professors insisted was a mockery of everything an English degree stands for. It’s true, nobody’s going to flip through his volumes and accuse Bukowski’s poems of screaming, “I am poetry!” My professors dismissed his work for being adolescent, asinine, misogynistic, and banal. Yet his poetry remains endearing and essential to our understanding of the human condition and how hard it is to live. I think of Bukowski as the poet without pretense, privilege or sheen. And like him, I didn’t grow up among manicured people either. I come from farmers. Like Bukowski’s working-class people, my people lack a grand education. My father never went to school past the sixth grade and my parents have no lofty aspirations for me. The fact that my brothers and I can read and write is good enough for them, though I admit my parents made me take organ lessons as a kid in case I wanted to make a name for myself in the ecclesiastical world. Unlike Bukowski, however, I had St. Francis of Assisi for a father and Florence Nightingale for a mother. I was loved and cherished every single day of my childhood. Bukowski was beaten weekly. Also unlike Bukowski, my family believes that spilling your guts is as attractive as it sounds and shouldn’t be done. Bukowski may not have had a college degree, but he was a well-read man. Between jobs, he spent time at the library reading and was influenced by more than one professor-approved writer: Whitman, Hemingway, Neruda, William Carlos Williams, e.e. cummings, George Orwell, and Bukowski’s favorite, Robinson Jeffers, referring to him as strong, and dark, modern and mad. His god. Bukowski too acknowledges an appreciation for John Fante, whose novel, Ask the Dust, he also discovered in the library, giving Bukowski the idea to portray in his writing, the solitary, isolated man as a subjective narrator. The result of these influences is an openness of line, the celebrating of the direct experience and the intimate use of “I”—at once a wonder and a curse. In a weird, Emily Dickinson kind of way, he is always looking out the window into the world, watching and recording. Retreating. Bukowski’s writing remains an embracing of what we cannot control or waited too long to avoid. He’s not only for the working-class laborer, but for anyone who’s had their life derailed. His voice speaks of the American dreamers who don’t get it right, and worse. The ones who get it wrong over and over and over. His weaker poems display limited perceptions of men and women, otherwise known as stereotypes, where you can witness shallow thoughts and behavior, the sneering, the judging, and the dismissals that follow. But the best of his tender poems value companionship and empathize with imperfection. His world revolves around women but they are a species he’ll never understand. When he writes about them, his narrator is wounded and befuddled. her since. she’s not at her place. The old man would have been 92 today if he were alive. “I made a mistake” is a reminder that age does not always bring wisdom. And that, for me, is part of the draw. He’s sooo human. His poems have him floundering in love’s quicksand. He writes about love’s magic, love’s betrayal, love’s loneliness, love’s hurt, love’s sting, and love’s dizziness caused by an overload of emotion and desire. Love, to Bukowski, is often an inescapable plague. With no cure. And oh yes. Love is also a dog from Hell. but that didn’t happen. your letters got sadder. By living among could-have-beens and has-beens, he associates himself with the mad, the poor, the agonized and the powerless, sharing their suppression and their suffering. In his autobiographical poems, he’s working marginal jobs when he’s not getting fired from them. I don’t think that he was against work per se, but rather, like many of us who have had a crappy shift job and get tired of taking orders, he just believes that he’s meant for something better. Bukowski not only laments the waste of talent but the way life wrecks the best of intentions. He’s also more concerned about the deceptions of intellect than the aftermath of an emotional storm. Again, it is with his uncluttered, economy of words and line that he tries to lay bare his belief that artists must be true to their art. The poet also acknowledges being too close to his art, leaving him unusually exposed and not in control. With Bukowski’s poems, there is always a degree of ironic self-awareness. Between the American dream of making it big and being rich are poems of homelessness and of dismal failure. Society’s so-called “making it” is a perception. A phony utopia. in an old brown shirt. in this sky of fire. 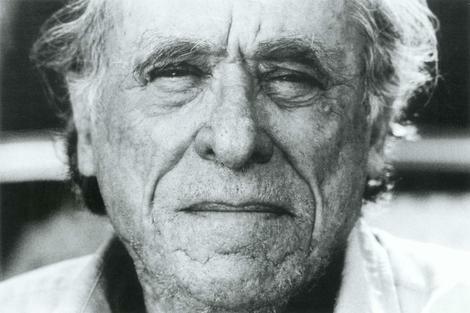 There are a number of biographies out there on Bukowski. Charles Bukowski: Locked in the Arms of a Crazy Life by Howard Sounes, and Bukowski: A Life, by Neeli Cherkovski are two of the best, I think. They dissect the man, the myth, and the persona that became Bukowski’s stamp, and I’ll leave that to them, and focus on the fact that, despite the profanity, the black-comedy, and bleakness, I like the shoes some of his poetry puts me in. He’s a social critic, a romantic, a recluse, an aggressive observer, and a conduit. There’s randomness and dislocation broken up by long bouts of nothingness. Yet, as he rummages through the lives of misfits and his own jagged existence, he clutches at something like hope that he’ll actually find a human being intact. Sometimes he and his followers are referred to as the Meat School poets, poets whose writing is rough, tough, blunt, and confessional. Whether Bukowski intended it or not, his poems are culturally symbolic of working people, meaninglessness in day-to-day living, and a people not knowing what they want. People trapped in each other’s compulsions. Not committing themselves to life in order to avoid desolation. Like the people in Joyce’s Ulysses, they’re born, they go to work, reproduce, and die. Both writers allow the spectacle of being and decay to pursue its course. Critics be damned. Both recognize that the artist must have complete freedom to write about the world they’re born into, live in, or work in. Even if it’s the armpit of your home town. “Dirty realism” will on some level, I think, exist indefinite in American poetry. Too many people are wasting the best years of their lives in the trenches of the workplace. Too many people have failing relationships and dismal bank accounts. “The basic realities of the everyman existence are seldom mentioned in the poetry of the centuries,” he said. Bukowski also believed that “as the spirit wanes the form appears.” He believed it’s what poets do when they’re not writing from the heart and try to hide that fact in formal, stiff structure. I don’t know. I once hastily picked up a copy of Bukowski’s book, Notes from a Dirty Old Man at a garage sale. I don’t know what part of that title I didn’t believe, but it is by far the most obscene thing I have ever come across. Trust me. Don’t bother with it. Here are three of his poetry books I do recommend however: Dangling in the Tournefortia, Love is a Dog from Hell, and You Get so Alone at Times That is Just Makes Sense.